Villa La Estancis is a luxurious 5-star Cabo San Lucas resort located on the swimmable Medano Beach, there is no better place to soak up its ambiance. Guest accommodations in a privately owned villas with beautiful views of the famous Lands End. The ideal location allows you to stroll into town along the beach, walk along the side streets, a taxi or city bus. We have 24 hour front desk and security, easy, friendly, English speaking lobby service. Concierge Service and courteous Maid Service, Room Service, are All-Inclusive Option. individually-controlled air conditioning, flat screen televisions, ceiling fans, direct dial telephone, secure high-speed Internet access, electronic safes, full washer and dryer. Balcony with wet bar and refrigerator. Unique amenities include pillow top mattresses, custom furnishings, flat panel TV. DVDs iPod stereo systems. Masterbath- his and her vanity, jacuzzi tub and separate shower. Guest Suite private bath with shower, small refrigerator and coffee maker. Luxurious Swimming pools and Jacuzzis, enjoy 2 large infinity pools with a swim up bar, the pool area offers towels, food and beverages. Relax in one of the 5- ocean view Jacuzzi. Lounge chairs and umbrellas are available on the beach. Fitness Centers and a 5 Star Spa Facilities, Desert Spa. The Palmitta Market just outside Villa La Estancia. 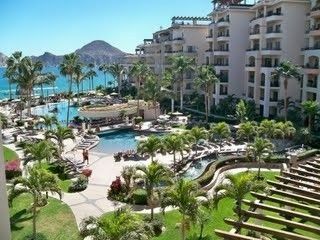 You have access to Villa Del Palmar and Villa Del Arc.